Speed is a detrimental aspect for players as fast footwork enables you to catch the ball early and deliver good shots back. Speed training in tennis should be more dynamic and intensive. It is essential to start your workout with a proper warm up, building your way up. Integrate more dynamic exercises instead of static ones. Ensuring you are warmed up properly is critical to prevent any risk of injury. Since explosive running in pursuing the ball will involve significant muscle contractions, it is imperative you cool down after such contractions as or else it could lead to accumulation of waste by-products, lactic acid and affect muscle performance. Cool down should involve gradual low-intensity exercises, ending with typical muscle stretching. Tennis barely requires its players to run in straight lines as no ball served from the opponent will be straight. 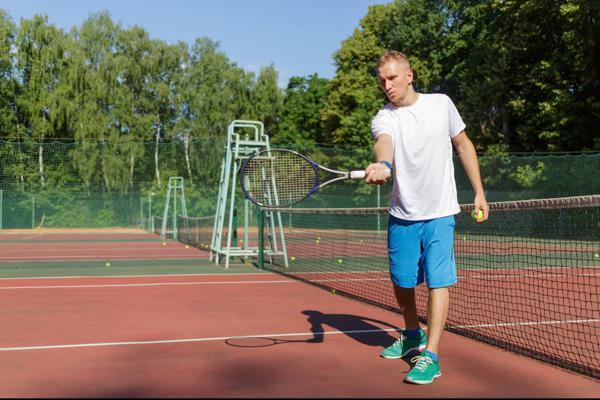 Tennis will need you to move in multiple directions with rapid speed and making shots. Training in straight lines is not practical for the game. Typically speed training involves sprinting minimum distances of 100m. But this is not the case in the game of tennis; as it requires you to run short distances, say about 5-10 m with explosive energy and speed. So, it is better to train your body and build up momentum in short distance practice. It is mandatory you train for foot speed as it is worthless if you are not able to reach your shots in time. In order for you to deliver shots, it is crucial you build up your foot speed. Many of the best players in the game possess remarkable foot speed. You can train for such rapid and explosive foot speed by integrating agility exercises such as ladder and cone drills. Since enhancing foot speed will involve running rapidly and intensely, you are bound to get tired. You need adequate rest of minimum 1 minute between each exercise to rest your muscles. Failing to rest adequately and training with zero to little rest will take a toll on your muscles, disabling you from performing with maximum output and efficiency. Thus, tend to integrate small rest periods to enable you to play each exercise with maximum intensity and progressively build up speed and endurance. Tennis and All About It!